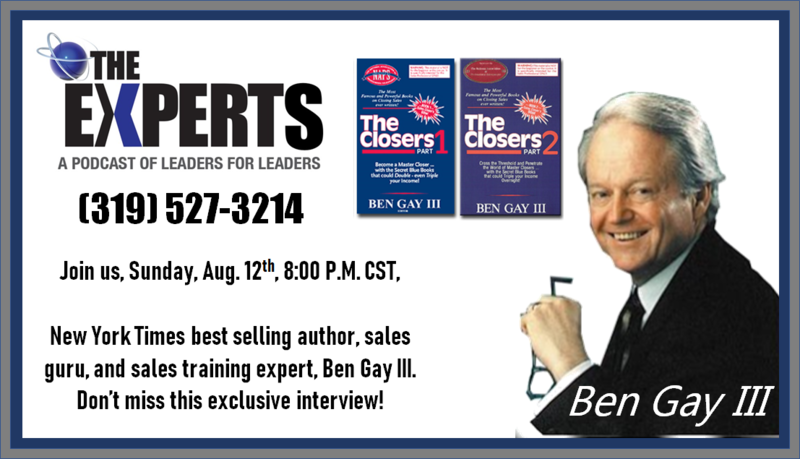 Ben Gay started selling at the age of 14 years old. He was the number one sales rep at every company he's every worked for including Macy's, a large 100 year old manufacturing company, the largest networking marketing company in the world at the time, a 50 year old consulting firm and more. He's authored 12 books, including The Closers I and The Closers II, which has sold more than 5 million copies worldwide. You can access his materials by going to bfg3.com. This interview was conducted by one of our very own leaders, John Griffin. John is a top 10 sales professional with Symmetry Financial Group out of 3,000+ agents. He has built several companies previously and training thousands of sales people on how to be one of the best. If you're looking for a possible career change, we encourage you to check out his website, watch his corporate overview video, and setup a phone interview to speak to John directly about career opportunities at SymmetryPreview.com/lp-griffin.